“There was certainly a greater atmosphere of awareness regarding the kapparot issue this year,” says UPC activist, David Rosenfeld, who with UPC member, Sam Schloss, distributed our brochures, A Wing & A Prayer - The Kapparot Chicken-Swinging Ritual, throughout Brooklyn and elsewhere in New York City this year and last. For more than a decade, United Poultry Concerns has worked to get members of the Jewish community who observe the ritual of atonement known as Kapparot (also spelled Kapores) to use money instead of chickens. Kapparot is a custom preceding Yom Kippur – the Jewish Day of Atonement which this year fell on October 8. In it, many ultra-Orthodox observers swing chickens over their heads while reciting verses about transferring their sins symbolically onto the bird. 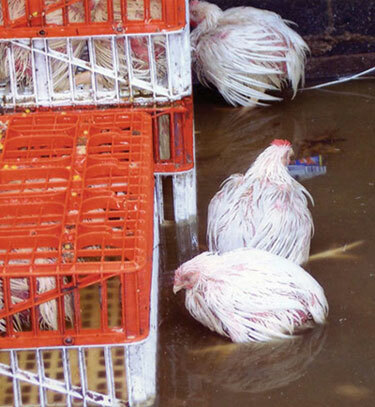 The chicken is then usually slaughtered, and may or may not be given to charity, though many birds so used are dehydrated, starving, and visibly injured. Before the ceremony, the chickens are typically crammed in crates for days without food, water or shelter. In Los Angeles, live birds have been seen with partially cut necks being thrown into garbage bags in front of screaming children. In 2005, Time Out New York reported “hundreds of crates stacked high in an idling 16-wheeler.” The slaughter filled “Brooklyn streets with blood and feathers” amid “deafening” cries of chickens and children. Our brochures, A Wing & A Prayer - The Kapparot Chicken-Swinging Ritual, are available for a small donation of $3 for 30 brochures. Please order these brochures and distribute them to your local news media and to anyone else you think might be helpful. To view the brochure online, go to www.upc-online.org/kaparos. We are grateful to everyone who assisted our compassionate Kapparot campaign this year, and we look forward to your continued involvement on behalf of the chickens in 2009.